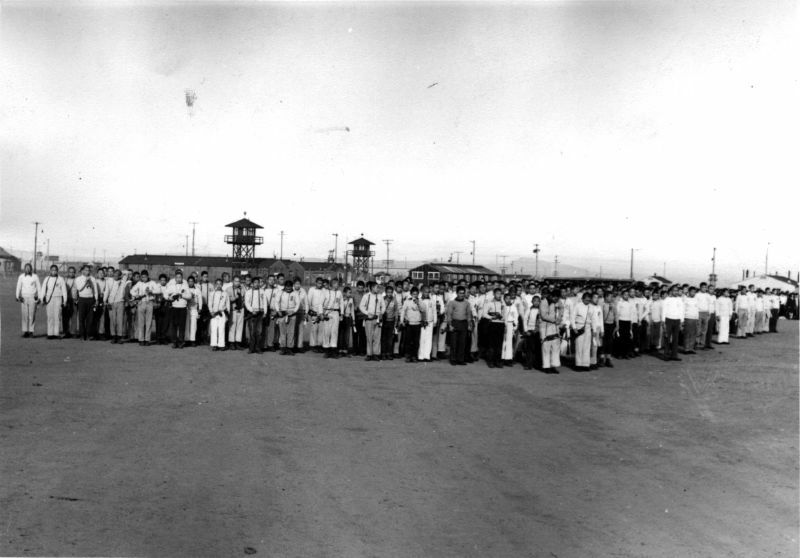 Document Notes: Photos of Pro-Japan sympathizers in the Tule Lake Segregation Center. There were thousands of individuals loyal to Japan at Tule Lake after the segregation of disloyals. These photos show, among other things, military drills and ceremonies. That thousands had petitioned the government to be returned to Japan to fight against the U.S. makes one wonder what would have happened had they been allowed to run loose on the West Coast during a time when we were taking tens of thousands of casualties in the Philippines, Iwo Jima and Okinawa. These folks were certified fanatics. Page Notes: Mass demonstration in main fire break of Hokoku Seinen Dan following circulation of Special Project Regulations. Pro-Japan organization.